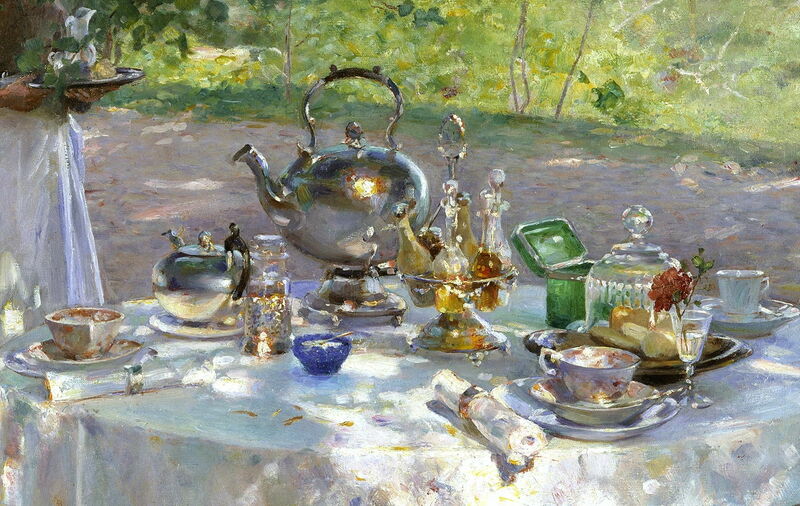 Hanna Pauli (1864-1940), Breakfast-Time (detail) (1887), oil on canvas, 87 x 91 cm, Nationalmuseum, Stockholm, Sweden. Wikimedia Commons. Stockholm underwent dramatic changes during the nineteenth century. When Carl Larsson was born there in 1853, there were still squalid slums, which were a breeding ground for diseases like cholera. About a million Swedish people emigrated to the US over a period of forty years, in their bid to improve their lot. For the affluent and well-educated, the capital city of Sweden opened new opportunities, but they too often involved overseas travel. Eva Bonnier, the daughter of a publisher, and Hanna Hirsch, the daughter of a music publisher, had set their eyes on the city of Paris. They had trained together, first in August Malmström’s painting school, then at the Royal Swedish Academy of Arts; they were good friends, and once they got to Paris in 1883, they shared a studio for a while. They both met with success in Paris: Hirsch had her first painting accepted by the Salon in 1887, and Bonnier received an honourable mention for one of hers exhibited there in 1889. Hirsch studied at the Académie Colarossi, but I don’t know where Bonnier trained. From there, their lives diverged. Eva Bonnier’s paintings in Paris were full of light. Eva Bonnier (1857–1909), View from the Studio Door (1885), oil on canvas, 79 x 64 cm, Bonniers porträttsamling, Nedre Manilla, Stockholm, Sweden. Wikimedia Commons. 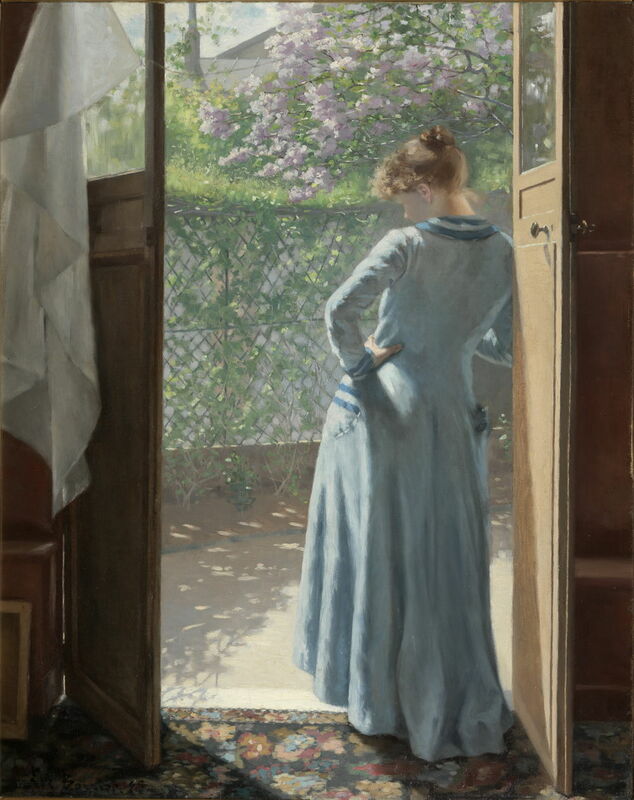 Her View from the Studio Door (1885) uses the repoussoir of the studio door to frame the wonderful light of the flowers and garden outside. I wonder if the figure here is that of Hanna Hirsch? Eva Bonnier (1857–1909), Interior of a Studio in Paris (1886), oil on canvas, 41 × 32 cm, Nationalmuseum, Stockholm, Sweden. Wikimedia Commons. 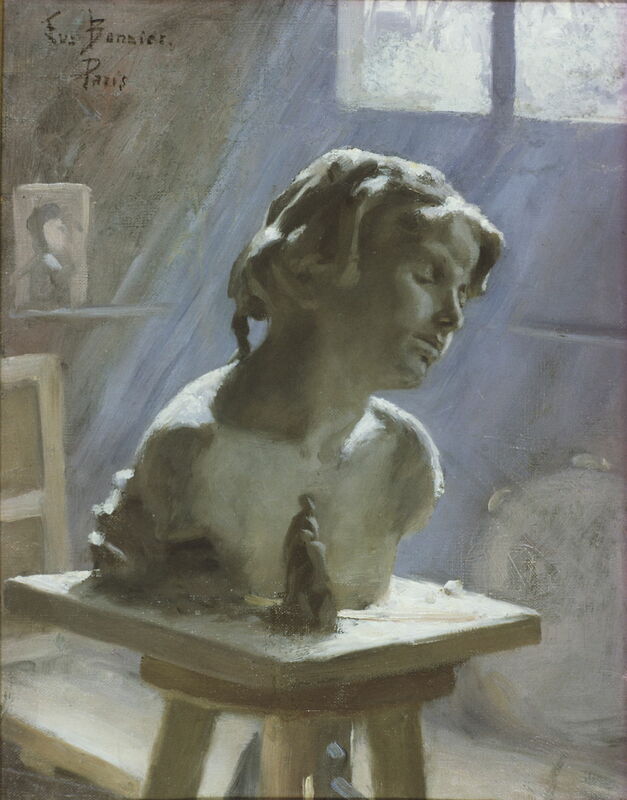 In Bonnier’s Interior of a Studio in Paris (1886) the light streams in through the window and brings a sculpted bust to life. Eva Bonnier (1857–1909), Reflection in Blue (1887), oil on canvas, 80 x 64 cm Nationalmuseum, Stockholm, Sweden. Wikimedia Commons. Reflection in Blue (1887) is one a series of portraits which she painted of friends and relatives during their sickness and convalescence, which include her sister-in-law Lisen in 1890. In each, brightly-lit white bed linen contrasts with the frail condition of the subject. 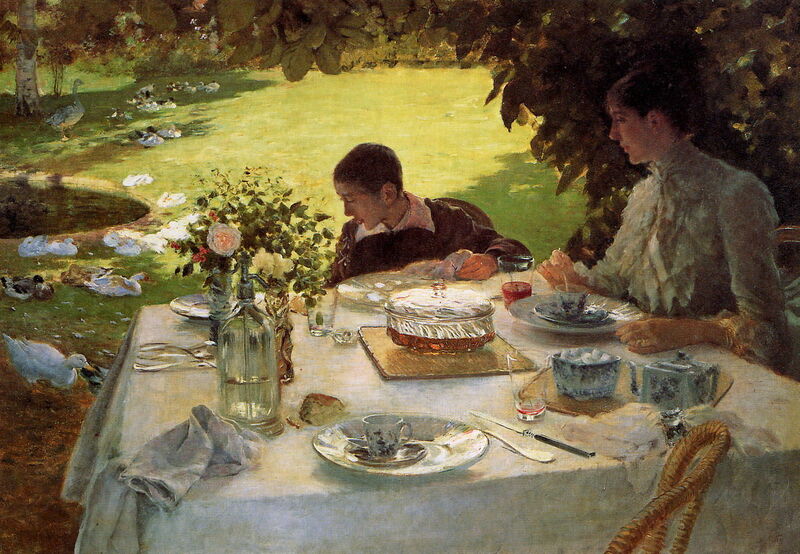 Bonnier returned to Stockholm in 1889, and painted fine portraits, many of which can be seen in the collection in the family home at Nedre Manilla in Stockholm. Eva Bonnier (1857–1909), Midsummer (1900), oil on canvas, 67 × 130 cm, location not known. Wikimedia Commons. 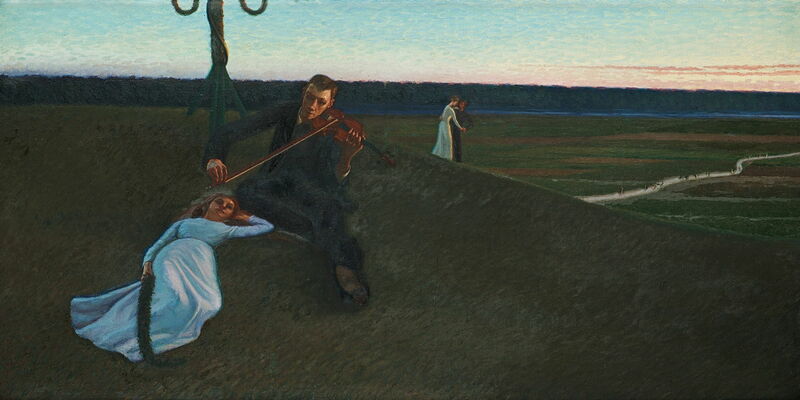 Her Midsummer (1900) uses quite a different light, the magical twilight of the middle of a Nordic midsummer night. Bonnier’s lights memories of the past, perhaps: a young girl resting on the ground to listen to the music of a violin, or, when older, dancing on the grass. At about that time, Bonnier seems to have stopped painting, apparently devoting her time to philanthropy. She started a foundation – still active today – to make Stockholm a more beautiful and culturally-rich city. In its early years, it provided funds for the purchase of works of art for schools and public institutions. Bonnier had suffered bouts of depression, though, and in 1909, at the age of only 51, she tragically took her own life. 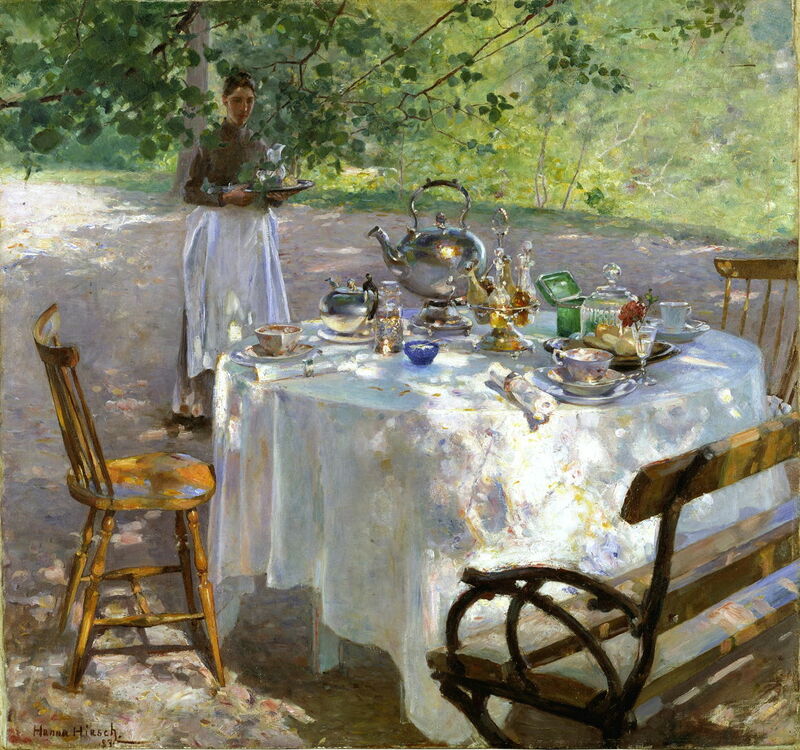 Hanna Pauli (1864-1940), Breakfast-Time (1887), oil on canvas, 87 x 91 cm, Nationalmuseum, Stockholm, Sweden. Wikimedia Commons. Hanna Hirsch’s Breakfast-Time (1887) is a dazzlingly virtuoso painting, showing a maid preparing a breakfast table in a garden. It strikes a wonderful balance between the painterliness of the ground and wooden furniture, and sufficient detail to bring the silverware, porcelain and glass to life. Getting these reflective surfaces and their textures to work just right is very technically demanding. Hirsch’s great accomplishment was doing so whilst not getting too tight in their detail. I could look at this painting for hours, all the time noticing new subtleties. I wonder if Hirsch might have seen De Nittis’ Breakfast in the Garden, which he had painted just a few years earlier in about 1883, shortly before his untimely death? Hanna Hirsch married the Swedish painter Georg Pauli (1855-1935) in 1887, and went with him to Italy for a year. Thereafter, she seems to have painted infrequently, but usually superbly. Hanna Pauli (1864–1940), The Artist’s Son Göran, 3 Months Old, Discovering a Candle Flame for the First Time (1891), oil on canvas, dimensions not known, Nationalmuseum, Stockholm, Sweden. Wikimedia Commons. 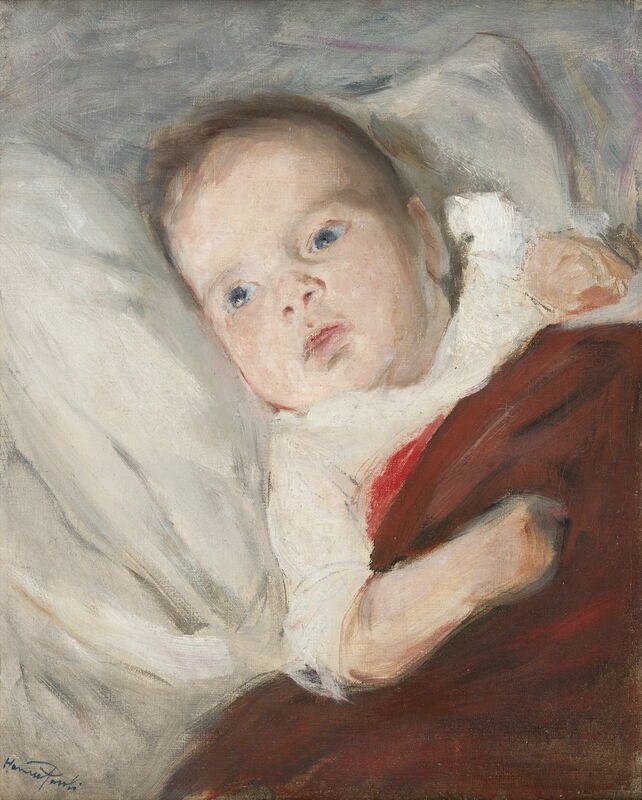 Her tender and intimate portrait of her infant son, in The Artist’s Son Göran (1891), shows him when he was only three months old, fascinated by the flame of a candle, which he had first noticed then. 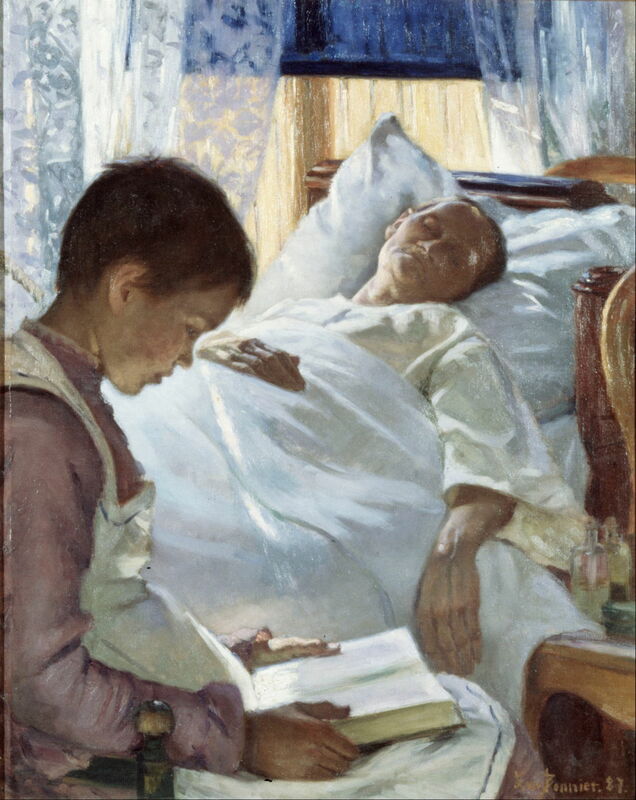 Hanna Pauli (1864-1940), Friends (1900-07), oil on canvas, 204 x 260 cm, Nationalmuseum, Stockholm, Sweden. Wikimedia Commons. 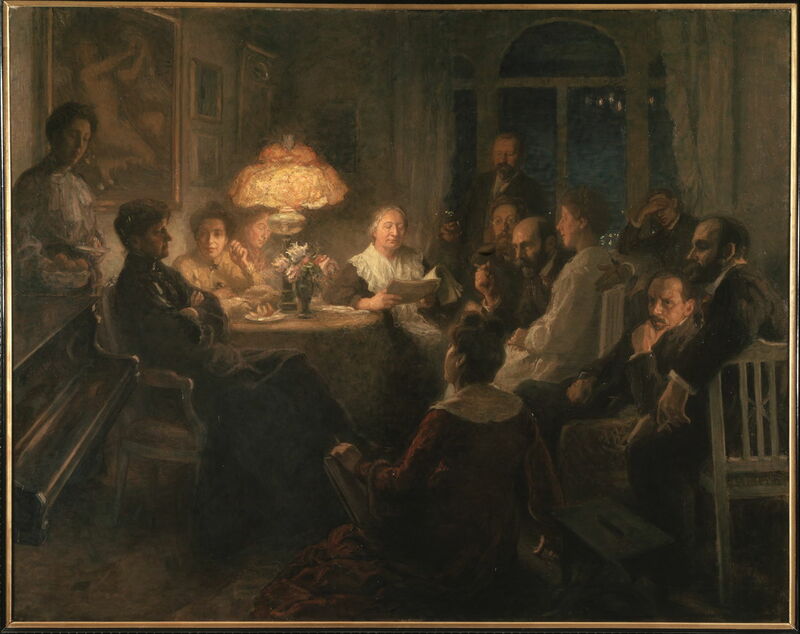 Her later group portrait of Friends (1900-07) shows the writer Ellen Key (1849-1926), a ‘difference’ feminist and advocate of child-centred parenting and learning, reading in the Pauli family home. Third from the left is Lisen Bonnier, Eva’s sister-in-law, but Eva is not shown. Hanna Hirsch-Pauli died in 1940, just short of her seventy-seventh birthday. For once, Eva Bonnier’s and Hanna Hirsch-Pauli’s paintings are far from neglected. You can see some of their best in Stockholm’s National Museum, including that brilliant Breakfast-Time. Posted in General, Painting and tagged Bonnier, de Nittis, Hirsch, Larsson, painting, Pauli, Sweden, women in art. Bookmark the permalink.